NYC, 04/25/2019, 2:00PM. 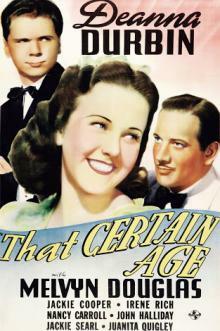 That Certain Age (1938): Two Time Oscar Nominated Musical. A young girl singer falls for an older, unattainable man. 95 min. Director: Edward Ludwig. Starring Deanna Durbin, Melvyn Douglas, Jackie Cooper. That Certain Age has two Academy Award nominations for Best Original Song and Best Sound Recording.